1) Paper lanterns – I love the look of paper lanterns. I’ve made room for them in every home I’ve ever had. They are fresh, fun and make for great accent lighting. When placed properly, they create vertical balance in the room and add a splash of color. Years ago, the only place I could find them was furniture stores like Ikea and Wicker Emporium. Now they seem to be popping up everywhere including the Dollar store. I scored a package of 5 from eBay for $4 including shipping. 2) Piggy banks – This classic element combines function and style so it was a must to include on this list. I love the idea of painting a piggy bank at one of those paint your own pottery studios. It would make such a meaningful addition to your nursery. If crafting isn’t your thing, you will find a huge variety to choose from in the stores. They seem to come in all colors, shapes and sizes from stripes and polka dots to more elegant finishes. Chase loved shaking the money out of his piggy bank and putting each coin back through the slot one-by-one. Now that he is older, it’s been a fun prop as we teach the value of saving money. 3) Wall decals – Wall decals can make a huge impact in a room. They are a great way to establish a theme or pull a color scheme together and again, create that vertical interest. After drooling over wall decals for months I finally made a decision and placed an order. It’s arrival was highly anticipated so when the doorbell rang that morning, it didn’t matter how enormously pregnant I was! I was out of bed and greeting the courier in a matter of seconds. As soon as the door slammed I was in the nursery putting it up. As much as I love the wall decal, it brings me great joy to see how much Chase loved it. Some of his earlier words included, “tree”, “leaf” and “birdie”, after spending many mornings pointing to the brightly colored images attached to the wall. 4) Monogram – A monogram is a perfect way to personalize your baby’s space. You can find inexpensive wood or foam letters at gift shops, craft stores and dollar stores. I love the look of a single letter sitting on a floating shelf amongst other knick knacks. For a more feminine look, you could hang a single letter on the wall with pretty ribbon. Another more popular option is to hang wooden letters on the wall to spell your baby’s name. For Chase’s nursery, we found a wooden letter “C” and painted it to match the accent color in his room. Our wall decal came with flowers which we chose not to use, so instead we used the centers of the flowers to decorate our wooden letter with fun polka dots. 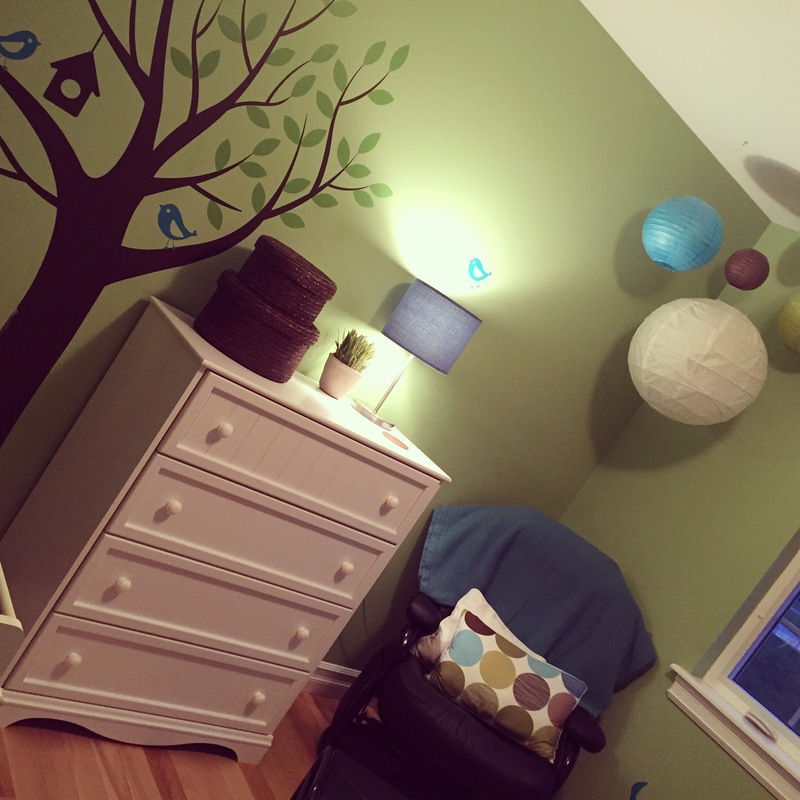 When we redecorated for his big-boy room, we just repainted it to match his new colors and mounted it on his door. 5) Growth chart – I know it’s cliché but everyone tells you how fast the time goes and how fast your kids will grow. A growth chart is a great way to watch that happen and remember how little they once were. I’ve seen growth charts come in many themes and varieties including wall decals, wooden wall hangings and plush hangings. The growth chart we picked up is actually a cardboard book that folds out for hanging on the wall. I liked this idea because someday I can fold it up again and tuck it into the baby book for a keepsake. It will also come in handy to preserve those memories when we move. Now if only I could remember to measure him every month!